A business banner stand is meant to draw people’s attention quickly and from a distance, so it’s important to make it stand out! 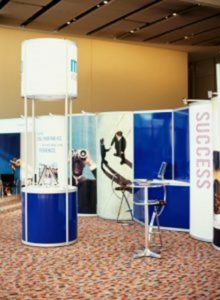 Banner stands are a great way to help your business stand out at trade shows and business events. The design of your banner stand is the first thing that most people will see, so it’s important that it is unique and eye-catching. Here are some tips for designing a business banner stand. Often times, there are templates available to assist you in designing your banner stand. These templates show you exactly how much space you have to work with and where your margins end. This is very helpful in making sure you can fit your design into the appropriate space. You don’t want to put too much information onto your business banner stand. Cramming too much information onto the banner can be overwhelming to people walking past and they likely won’t take the time to read it. A good rule of thumb is that if the main message takes more than three seconds to understand, then there are too many words on it. A business banner stand is supposed to make a quick, immediate impression on people. For this reason, one eye-catching image is better than a variety of small images. Multiple small images can be distracting and take too much time to look at. You want to use one image that directly relates to your business. Though cursive, curly fonts may appear to make your banner stand look better, they are not ideal. These fonts can be difficult to read from a distance which means that most people aren’t going to take the time to read it. You want to use big, bold, and easy to read fonts on your banner stand so that people can simply glance at it and know what type of message you are trying to convey. You never want to use more than three colors total on your business banner stand because it can be too distracting. When choosing colors, make sure that they relate to the message you are conveying. It’s a good idea to contrast the background color of your banner with the text. If the background is dark, use lighter text colors and vise versa. Contact Brand It Wrap It Today for Your Business Banner Stand! This entry was posted on Friday, September 28th, 2018 at 9:46 am. Both comments and pings are currently closed.